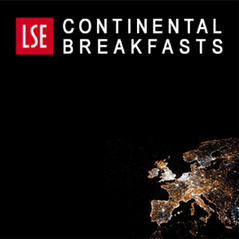 Susana Batel (University Institute of Lisbon) and Patrick Devine-Wright (University of Exeter) explore public beliefs about energy issues among differing identities in the UK, and explain how feelings of belonging to different imaginary communities appear to impact socio-political events such as Brexit. 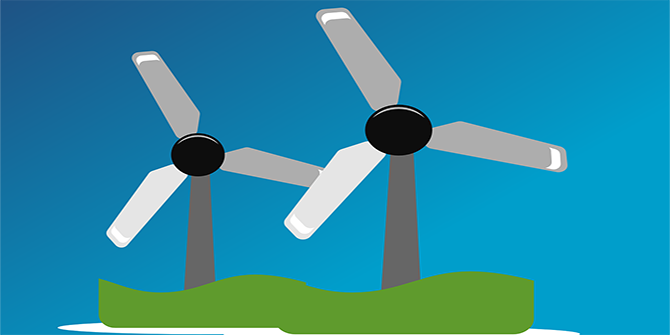 The deployment of renewable energy technologies and associated infrastructures has been very controversial in the UK in recent times. The deployment of energy infrastructure often follows European-level guidelines and regulations, which are then adopted by specific countries. In the years leading up to the 2016 referendum, right-wing populist discourses by political parties such as UKIP have reinforced Euroscepticism by, among other issues, challenging established energy policy priorities, such as meeting EU targets for increasing the production of renewable energy. A right-wing populist post-truth logic is used in those discourses: right-wing populist because they claim to talk for the people and against the system while pushing forward agendas such as anti-immigration; and post-truth because this is performed by appealing to the public’s concerns and fears – such as the ‘destruction of the British countryside’ by migrants and wind farms alike – while neglecting scientific evidence and facts – such as that climate change is happening due to human-related activities. It is then a relevant time to ask questions about the potential impacts of socio-political events such as Brexit on people’s beliefs about energy issues. And are those impacts accompanied by changes in people’s feelings of belongingness to Britain and Europe? Do right-wing populist discourses influence discourses about sustainable energy transitions? We have tried to start giving some answers to these questions by examining data collected in 2007 and 2012 through large-scale surveys completed by representative samples of UK adults. First, we asked participants how important were British and European identities in describing who they are and from there we considered four types of identity profiles, namely, not feeling very British or very European (identified as ‘Low’); feeling both very European and very British (identified as ‘High’); feeling more British than European (identified as ‘Brit>Euro’); and, inversely, feeling more European than British (identified as ‘Euro>Brit’) (see Figure 1). The data shows that the percentage of people feeling more British than European increased substantially from 2007 to 2012 and this trend is also supported by Eurobarometer survey data from 2006 to 2016. 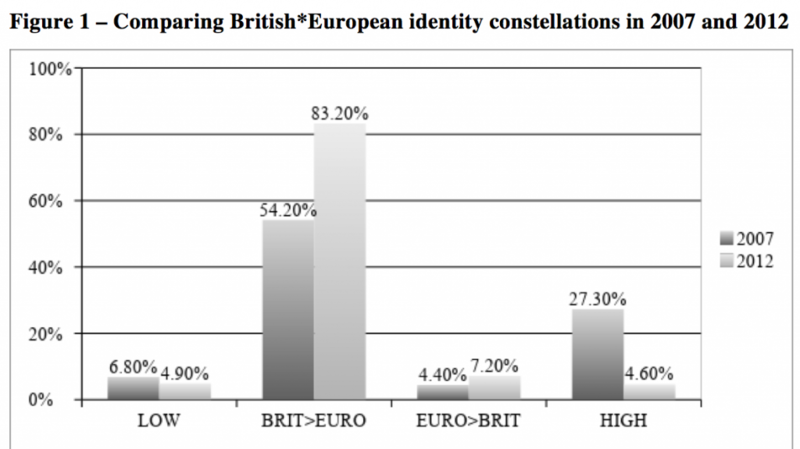 In addition, the percentage of those who felt equally British and European decreased from 2007 to 2012, suggesting that these might be the individuals that started to feel more British than European across this period. But what relation might these changes have with UK residents’ beliefs and practices regarding energy and specifically the deployment of renewable energy and associated infrastructures? We have looked at the results from the Eurobarometer survey regarding questions about whether UK respondents think that decisions about energy policy and decisions about the protection of the environment should be made by the UK government or jointly with the EU (Figs. 2 and 3). 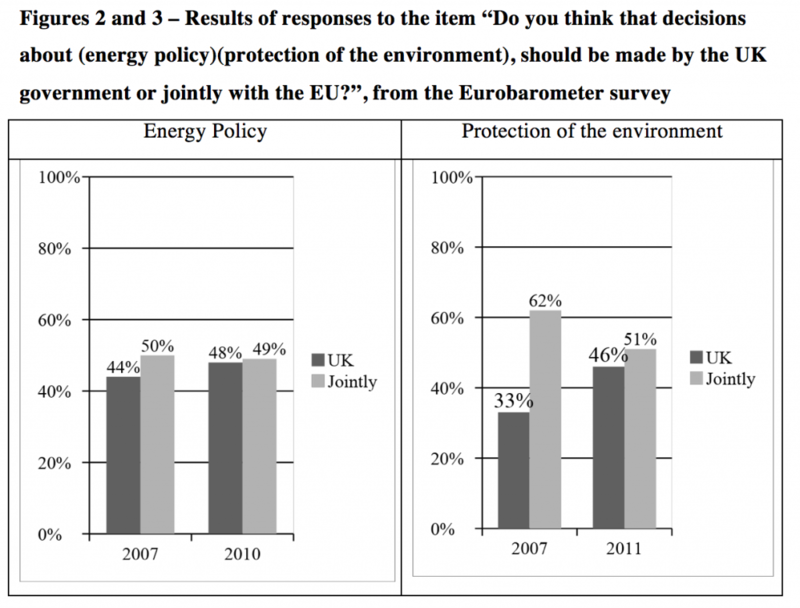 There was an increase in the percentage of UK respondents who believed that such decisions should be made by the UK government only between 2007 and 2010/11 – and a decrease of those thinking that decisions about these issues should be made together with the EU, especially regarding the protection of the environment. Despite the differences being marginal (especially regarding beliefs about energy policy), this trend seems to accompany another trend: of people tending to feel more British and less European across those years. We have also examined how UK residents’ identities directly relate with their beliefs regarding high-voltage power lines, which have been deployed to integrate renewable energy infrastructures into the grid, both within and between European countries. The analyses suggest that, in 2007, the more people felt Scottish, Northern Irish, Irish, or European, the more they supported the construction of a European ‘Super Grid’ (described in the survey as ‘a system that would interconnect the national grid networks of different European states’). Results show significant associations, although correlations are not very strong, especially taking into account the large sample size. By contrast, feeling British, English or Welsh does not seem to relate in any way to supporting a European Super Grid. The more participants feel English, the more they are likely to say that ‘ensuring the UK’s energy independence’ and ‘avoiding blackouts under any circumstances’ are one of the three important priorities for national energy policy. Inversely, those with stronger European identities seem to feel that UK energy independence is less important as a policy goal. This reinforces the idea that identities – or feelings of belongingness to certain imaginary communities, such as Britain – do play a role in energy beliefs and thus that the rise of right-wing populism might give way to more closeness, competitiveness and conservatism, namely in British energy policies, through more salient national identities. In survey data from 2012, the same pattern was found, albeit more markedly. This survey asked questions about belonging at multiple levels from local to global – strength of belonging to your neighborhood, country, Europe, and the whole Earth. Analysis of the data showed that feeling that one belongs to Britain does not relate with beliefs about the construction of a European-wide grid, whereas feeling that one belongs to Europe or to the whole Earth are significantly and positively correlated with supporting the construction of a pan-European grid network. Also, it is the participants who indicated feeling they belong more to the neighborhood and those feeling they belong more to the whole Earth who believe that a more climate friendly system is not dependent on constructing more powerlines. Those feeling they belong more to the neighborhood, the region, Britain and/or the Earth, are also more willing to reduce their personal electricity consumption in order to avoid constructing new power lines. This might be seen as slightly at odds with the results for 2007 in which those feeling more English were willing to accept ‘everything’ to avoid blackouts and ensure the UK’s independence. This seems to suggest changes in energy beliefs that accompany changes in belongingness to different groups, with the timeframe and socio-political events leading to Brexit accentuating the rejection of European-level policies. These changes might be associated with an increase in the deployment of power lines and other large-scale renewable energy infrastructures and, we might speculate, eventually a more widespread belief in ensuring the UK’s energy security through other means – either in the sources of energy production (e.g., nuclear; shale gas), or in the ways in which renewables are deployed (e.g., more decentralized, with smaller scale schemes led by councils or local communities). The analyses presented illustrate that intergroup relations and dynamics at different scales are important to examine as a barrier to and/or a facilitator of the deployment of renewable energy generation and associated infrastructures within and beyond national boundaries. Future research should further explore those dynamics and their relation with socio-political climates and events. The above draws on the authors’ published work in Energy Reseach & Social Science. It first appeared on LSE British Politics and Policy. 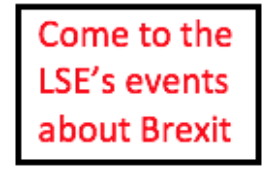 It represents the views of the authors and not those of the Brexit blog, nor the LSE. Featured image credit: Pixabay (Public Domain). 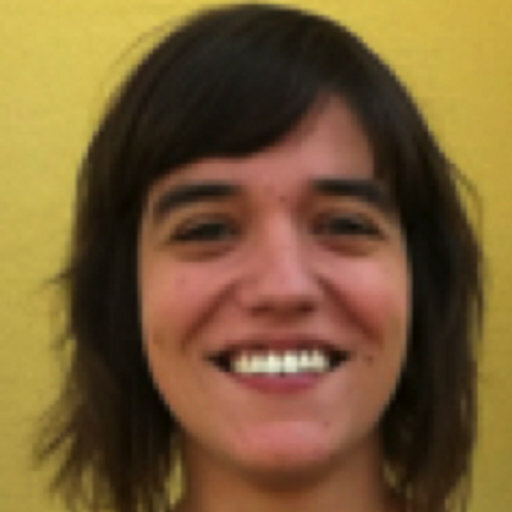 Susana Batel is Integrated Researcher at Cis-IUL, University Institute of Lisbon, Portugal, and Visiting Fellow at the Geography School, University of Exeter and at the Institute of Social Psychology at the LSE. 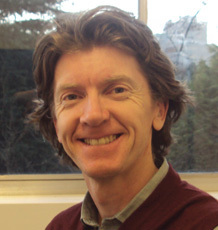 Patrick Devine-Wright is Professor in Human Geography at the University of Exeter.